Born in the gentle mountains of Appalachia, Angela Blueskies is a visionary musician, medicine woman, and facilitator who carries deep understanding of the healing powers of music and the Earth. For over 25 years she has followed the call of the heart in the path of conscious awakening, a path that has taken her around the world and shaped every facet of her life and work. In the past decade, Angela has devoted her path to supporting others in the journey of healing and transformation, creating spaces and experiences that allow for deep connection to self and Spirit. Rising from humble roots in Bristol, Tennessee, the birthplace of country music, Angela began playing flute at age nine, and was largely self taught until high school. She loved playing from the very beginning, and her passion was ignited. She knew at a young age that she would pursue music as her profession, and courageously followed her passion all the way to the Peabody Conservatory of Music, where she was a scholarship student, and the recipient of numerous awards, fellowships, and prizes. Even while still a student, Angela began to connect with music beyond the confines of her classical music training, and through the early years of her career, she found herself immersed in music from around the world, including the music of the Himalayas, African trance drumming, traditional Celtic folk music, Native American flute music and ceremonial songs. As a teaching artist for both the Baltimore Symphony Orchestra and the Choral Arts Society of Washington, she had the distinct opportunity to explore diverse cultural traditions of music as a tool for teaching, storytelling, and cultural understanding. It was during this time that Angela began to travel extensively, making direct contact with global traditions of song, music, and sound that were a direct revelation of identity, a modality of body/mind/spirit healing, and an expression of the continuity of rich and complex tradition. With a deeper awareness of music as far more than a medium of entertainment, Angela was called to redefine her path as a musician, leaving behind classical music and embracing a new direction that was more expansive and more aligned with her own heart. 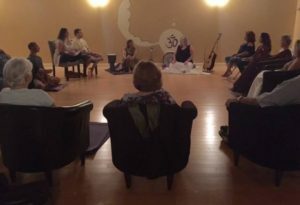 Around the same time that Angela began to explore music and sound in new ways, she began to study yoga, and found herself drawn not only to practices of mind/body presence, but also practices of working with sound as a tool for meditation, including the paths of Nada Yoga and Bhakti Yoga. In her travels, she also encountered the sacred songs of the Q’ero people of the high Andes Mountains of Peru, as well as the healing icaros and medicine songs used by healers in the traditions of the Peruvian Amazon. In the spiritual alchemy of the Sacred Valley of Peru, Angela discovered the powerful intersection of all these traditions, and she has continued to journey there since 2005, embracing a path of music and healing both for her own personal growth, as well as in service of others. Angela has performed in concert halls, churches, schools, yoga studios, temples, in nature, and in sacred ceremony across four continents. She has released two albums: Songs of Spirit, a collection of original uplifting songs, some with mantras; and Sound Medicine Meditations, a series of spacious, simple sound meditations meant to guide one’s personal practice. With a pure vocal quality, lush, beautiful harmonies, and rich instrumentation, Angela’s music brings people into profound meditative and ecstatic states and inspires deep connection to the heart. While a student at Peabody, Angela began to explore holistic healing modalities. Incapacitated for half a year with a performance injury and finding little support within the western medical paradigm, alternative modalities offered immense relief, and her curiosity grew. Several years later while walking the Camino de Santiago pilgrimage in Spain, she injured her leg, and met an incredible healer that resolved her pain in a matter of hours, not days, and she committed herself to learning more. In early 2005, she was initiated into Usui Reiki, and was certified as a Reiki Master in 2009. Though she completed Therapeutic Massage training, she found herself far more at home with more subtle work, and has trained extensively in energy healing modalities, as well as aromatherapy. In 2005, Angela first travelled to Peru as a part of her graduate school research into contemporary pilgrimage. In the mountains over Cusco, she began to learn the traditions and cosmology of the Andean sacred ways, and was blessed to be gifted the Despacho Ceremony tradition, and was encouraged to carry it forward in the western world. Visiting sacred temples and land, making offerings of gratitude and respect, and praying for healing for the whole world, a new direction was opened in her life. She returned to Peru two years later, formally committing herself to learning the sacred traditions of Peru, and began to find mentors who have continued to guide her path ever since. Through deep connection with the traditions of the high Andes and Amazon, Angela encountered healers working with medicine songs and icaros, using the messages, energy, and vibration of sound and music to usher forth strong healing. In those days, her two paths coalesced into one. Eventually calling her work Sound Medicine, Angela has birthed a unique approach to sound healing. 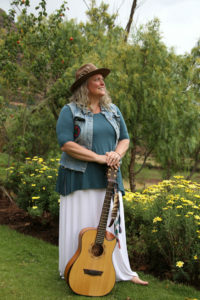 Bringing together her sensitivity as a healer with her gifts as a lifelong musician, Sound Medicine is a fusion of conscious, uplifting song (accompanied by guitar, drum, and harmonium), improvisatory instrumental music (flute), and abstract, spacious sound (crystal and Himalayan singing bowls, chimes, gong). Today, Angela’s healing work encompasses far more than Sound Medicine. She is an initiate in the Andean Q’ero tradition, and has studied a variety of healing modalities in the realm of Shamanic Healing. She also practices Ancestral Lineage Healing, bringing together ancient traditions of ancestor work with our unique 21st century needs in terms of repairing personal, familial, and cultural wounding and traumas. Believing that there are many approaches to supporting people in the journey of healing and awakening, some of her work provides the space for clients to be receptive, and other work calls clients to be engaged and self-empowering in the process. Sometimes clients simply need the support of someone who understands and can help support culturally misunderstood experiences, including those who are empathic; those with emerging gifts of knowing/sight/sensitivity; and those who carry strong energetic openness and connection to the unseen. With great heart, Angela offers her support and wisdom. Angela began teaching music to other kids when she was still a kid herself. Growing up in a fairly rural area, Angela’s musical gifts landed her a full schedule of flute students by the time she entered high school. Teaching came naturally to her, and by the time she was in her early 20s, she had a full studio of young musicians under her tutelage. As a teaching artist and artist-in-residence in schools throughout Maryland, Virginia, and Washington, DC, Angela found herself equally at home with groups, and enjoyed engaging students in the creative process. 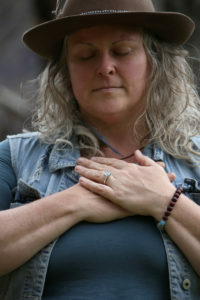 As she began to teach more adults, she brought similar ideas together to form empowering creative workshops and online classes, including the Free Your Voice program for adults longing to move beyond blocks to singing, and The Power of Healing Sound workshops, empowering people to explore ways to bring sound and vibrational healing into their lives and work as a complimentary discipline. 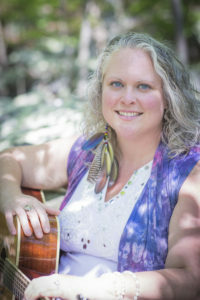 Beyond music, she also facilitates workshops connected to Shamanic Healing, including Shamanic Journeying, Ancestral Lineage Healing, Despacho Ceremony, and more. She is an enthusiastic and loving teacher and facilitator, and enjoys empowering people in connecting with themselves, their gifts, and their own inner wisdom.